We like to think of Cinco de Mayo as the best excuse ever to eat Mexican food ever. Meaning "Fifth of May" in Spanish, Cinco de Mayo is a holiday celebrated (appropriately) on May 5 primarily in the United States and Mexico. It marks the Mexican army's unlikely victory over French forces at the Battle of Puebla on May 5, 1862. Americans often confuse it with Mexican Independence Day (September 16) -- an important national holiday in Mexico. If you're looking for a way to indulge in your love of Mexican-style food without breaking the carb or calorie bank, we have a secret "cheat" to share: Shirataki Rice. With 0 calories and 3 grams of carbs per serving, shirataki rice actually isn't rice at all. Like shirataki noodles, shirataki rice is made from a fibrous Asian root called konnyaku or konjac, then molded into the shape of rice grains or rice "pearls." 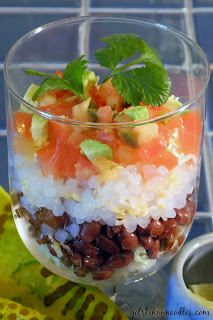 It's easy to use shirataki rice in place of regular white rice in your favorite Mexican recipes. Simply drain, rinse with water (adding 1-2 drops of vinegar to the rinse water if desired), then enjoy. Use shirataki rice in place of all or half of the rice (to cut carbs and calories in half) called for in recipes. Shirataki rice is a healthy alternative to white rice not only in Mexican dishes and Asian dishes, but also in soups. Once you try it, you'll find many uses for shirataki rice. And since it's a good source of fiber like shirataki noodles, shirataki rice fills you up and helps you feel satisfied without extra carbs or calories. 1) Like shirataki noodles, you can use shirataki rice in the slow cooker. Just add in the last 20 minutes of cooking. Because of its fiber content, shirataki rice won't get mushy. 2) To cut carbs and calories, you can substitute shirataki rice for part of the white rice in a rice cooker. Add just enough water to cook the white rice only. You don't need to add any extra water for the shirataki rice you put in the rice cooker. These Skinny Burrito Cups are a fun way to enjoy Cinco de Mayo or a light spring/summer meal -- with only 250 calories each. ¡Que delicioso! Rinse Skinny Rice Shirataki, drain well and set aside. In a medium skillet, pan fry Skinny Rice for 2-3 minutes. Assemble burrito cups by layering black beans, Skinny Rice, cheese (if desired), salsa, and avocado. Top with fresh cilantro. Omit cheese to make dairy-free. Makes 4 servings. Visit us at www.getskinnynoodles.com to learn more about shirataki noodles and shirataki rice, get cooking tips, and to explore all of our shirataki noodles and shirataki rice recipes!